There are countless DVD to MP4 copy software in the market, some of which are even totally free, for example, Handbrake. But it cannot rip and convert the latest copy-protected DVD to MPEG4 video, especially Disney movies. It is a pity if your favorite DVDs and hot movie DVDs like Venom, First Man, Mission: Impossible - Fallout, Incredibles 2, Ant-Man and the Wasp, Mamma Mia! Here We Go Again, Thor: Ragnarok, Avengers: Infinity War, Jurassic World: Fallen Kingdom, Coco, Deadpool 2, Zootopia etc. cannot be backed up on PC and played on Apple and Android devices in mobile way. So if you can find a powerful DVD to MP4 ripper, your life would be more vivid. * MP4 files are supported by many video programs and hardware devices, including Windows Movie Maker, Television, Apple iPhone/iPad/iPod, Android tab, Galaxy Tab, HTC, Samsung, XOOM, Kindle, Nokia, Motorola, etc. * MP4 can be played by 5KPlayer, The KMPlayer, Media Player Classic, MPlayer, QuickTime Player, VLC media player, Windows Media Player, XBMC Media Center, etc. * MP4 video file can be shared with others via email. * MP4 format allow for streaming via the internet. Here I'd like to recommend a well-known DVD ripper – WinX DVD Ripper Platinum. Yes, it is the platinum version of WinX Free DVD Ripper. Compared with the free one, WinX DVD Ripper Platinum has High Quality Engine, De-interlacing Engine and multi-core CPU utilization; it supports more input and output formats, for example ISO image loading, 3 DVD copy modes, and is compatible with more popular portable devices including iPad Pro/iPad mini 4. Besides, it also additionally supports the latest Disney Protected DVDs. - The Best Software to Copy Latest DVDs to MP4 Files Tiptop DVD ripping software to rip DVD to popular digital formats like MP4, AVI, MPEG, WMV, MOV, FLV, M2TS, MP3. Backup DVDs in 3 modes. The operation of this latest encrypted DVD to MP4 copy software is quite simple, which is even easy for beginners. Before you can rip the latest DVD movie to MPEG4 format video file, please make sure that you have downloaded and installed WinX DVD Ripper Platinum. Step 1: Run this program. Insert any DVD to your DVD-ROM, then click "DVD Disc" icon to load it. DVD folder or ISO image file is also accepted. Step 2: Choose "MP4 Video" or "MPEG4 Video" as the output format in the General Profiles or PC General Video Category. 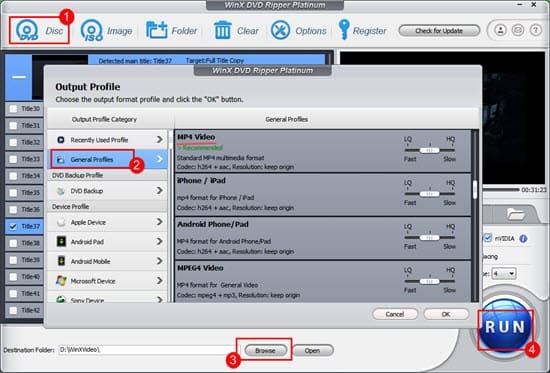 If you want to play DVD movie on iPad, iPhone, Surface Tab, PSP, mobile phone (3GP), Android device, you may find and choose the device name directly without manual parameter settings. As the pic shown below, you are enabled to rip latest DVD to MPEG 4 format. Note: You may also define an output folder saving place in your hard drive so that you can use the output MP4 video conveniently after the DVD to MP4 copying. Step 3: Hit "RUN" to begin ripping this DVD to a video with .mp4 file extension. The MP4 video converted from your original DVD is playable on PC, Apple, Android Devices, and so on. Rip DVD Inside Out: How to Rip and Copy Inside Out DVD to MP4, AVI, MOV and More? The ultimate DVD ripper software capable of ripping the content of DVDs to a wide range of mainstream video formats, such as DVD to AVI, MP4, MPEG, WMV, MOV, FLV, AVC, TS, MTS, M4V, etc. Users can also painlessly rip DVD (even encrypted DVD) to iPhone, iPad, Android and many other devices. This is a guide on how to rip and copy Disney protected DVD for family movie backup, not only removing Disney x-project DRM copy protection.